Sample-scan phase contrast imaging was demonstrated by producing and coherently recombining light from a pair of axially offset focal planes. Placing a homogeneous medium in one of the two focal planes enables quantitative phase imaging using only common-path optics, recovering absolute phase without halo or obliqueillumination artifacts. Axially offset foci separated by 70 μm with a 10x objective were produced through polarization wavefront shaping using a matched pair of custom-designed microretarder arrays, compatible with retrofitting into conventional commercial microscopes. Quantitative phase imaging was achieved by two complementary approaches: i) rotation of a half wave plate, and ii) 50 kHz polarization modulation with lock-in amplification for detection. A new type of microscope may give doctors a better idea of how safely and effectively a medication will perform in the body. A Purdue University team developed the microscope based on concepts of phase-contrast microscopy, which involves using optical devices to view molecules, membranes or other nanoscale items that may be too translucent to scatter the light involved with conventional microscopes. 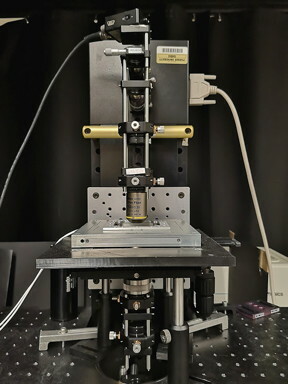 The Purdue microscope uses technology to interfere light from a sample plane and a featureless reference plane, quantitatively recovering the subtle phase shifts induced by the sample. The work is published in the Feb. 18 edition of Optics Express. Their work aligns with Purdue's Giant Leaps celebration, celebrating the university’s global advancements in health as part of Purdue’s 150th anniversary. Health research, including advanced biological imaging, is one of the four themes of the yearlong celebration’s Ideas Festival, designed to showcase Purdue as an intellectual center solving real-world issues. The Purdue Office of Technology Commercialization operates one of the most comprehensive technology transfer programs among leading research universities in the U.S. Services provided by this office support the economic development initiatives of Purdue University and benefit the university's academic activities. The office is managed by the Purdue Research Foundation, which received the 2016 Innovation and Economic Prosperity Universities Award for Innovation from the Association of Public and Land-grant Universities. For more information about funding and investment opportunities in startups based on a Purdue innovation, contact the Purdue Foundry at For more information on licensing a Purdue innovation, contact the Office of Technology Commercialization at The Purdue Research Foundation is a private, nonprofit foundation created to advance the mission of Purdue University.